2019 Mitsubishi Outlander Sport Trim Levels with Comparisons & Configurations. What 2019 Mitsubishi Outlander Sport Trim Level Should you Buy? What is the Difference Between Trims? If you are currently looking for a vehicle that does a good job at balancing practicality with functionality, then look no further than the 2019 Mitsubishi Outlander Sport. This crossover is well-equipped on all trim levels and offers a pretty generous warranty. It is also quite affordably priced, which is truly its biggest selling point. What the 2019 Mitsubishi Outlander Sport lacks is driving performance. The transmission is too slow to respond, which can be aggravating at best. Also, the ride quality goes downhill quickly when you take the Outlander Sport onto rougher road surfaces. The base 2.0-L engine is frustrating as well since it tends to produce a droning noise when you press down on the gas to accelerate. The bigger engine is better, but only barely so. Of course, the 2.4-L engine is the way to go, but you will have to spend more money on the newly line-topping GT trim to get it. But, for the 168 hp and 167 lb-ft of torque (compared to the 148 hp and 145 lb-ft of torque from the 2.0-L engine), it's worth the upgrade. Take note that front-wheel drive comes standard on all trim levels, but you can opt for all-wheel drive on any of them. The base 2.0 ES trim has a standard 5-speed manual transmission, but the rest come with a CVT. That being said, you are probably wondering which 2019 Mitsubishi Outlander Sport is the best trim model to fit your unique needs. There is one trim level that presents consumers with the best deal. Read through until the end of this comparison review. By then, you should have a good feel for which trim level (if any) is right for you. Compare the 2019 Mitsubishi Outlander Sport ES vs LE Trim Levels. What is the difference? 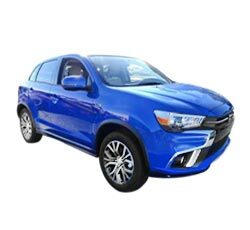 The base 2019 Mitsubishi Outlander Sport trim is known as the 2.0 ES. As mentioned above, it is powered by the 2.0-L engine, and its powertrain is rounded out by the 5-speed manual transmission. Electric power steering with an overall ratio of 43.69 mm/rev comes equipped. There is a 4-wheel anti-lock brake system that comes with brake assist and electronic brake force distribution. As is the case with all of the other trim levels, the 2.0 ES rides around on 18-inch aluminum alloy wheels. This trim (as well as the 2.0 LE and 2.0 SE) gets a combined 27 mpg (24 city/30 highway) on its front-wheel drive versions. The all-wheel drive models get 25 mpg combined (23 city/29 highway). The 2.0 LE is equipped with the same mechanical features, so there are no real differences to mention here. On the outside, both trim levels look fairly similar. The 2.0 ES and 2.0 LE come with standard halogen headlights, LED taillights, and color-keyed door handles and bumpers. The side mirrors are heated, and there is privacy glass on the rear window. A shark fin antenna and roof spoiler also make up the list of standard exterior features that these two trims share. So, how do you differentiate them just by glancing around the body? Well, for starters, the 2.0 LE has fog lights and LED daytime running lights. Also, the fuel door is set in dark alloy, and the side mirrors are black, not color-keyed like those on the 2.0 ES. The 2.0 LE also bears the Limited Edition badge and has black paint on the wheels. The interiors of the 2.0 ES and 2.0 LE are also fairly similar. The 2.0 ES and 2.0 LE share a color information display, cargo lights, a 6-way adjustable driver seat, a 4-way adjustable passenger seat, cloth upholstery, a tilt-and-telescoping steering column, and a remote fuel door release lever and trunk release lever. The 2.0 LE, however, equips a few more creature comforts. The front seats receive heating, and there is a leather-wrapped steering wheel, shift knob, and parking brake handle - all of which come with fine red stitching. Additionally, the 2.0 LE has aluminum pedals. There are also quite a few more convenience features to be found in the 2.0 LE. While the 2.0 ES has a 7-inch touchscreen display and 4-speaker audio system, HD Radio, Bluetooth capabilities, a USB port, a rearview camera, cruise control, automatic climate control, remote keyless entry, two 12-volt power outlets, cargo tie-down hooks, and a day/night rearview mirrors, the 2.0 LE ups the ante. It adds a 7-inch infotainment system touchscreen, smartphone app integration via Android Auto or Apple CarPlay, a 3-month trial subscription to SiriusXM Satellite Radio, voice controls mounted onto the steering wheel, and a second USB port. Both trims are equipped with all of the same standard safety features. These features include active stability control, traction control, a tire pressure monitoring system, an anti-theft alarm system and engine immobilizer, and the LATCH child restraint system. To get advanced driver aids, you will have to upgrade to the higher trim levels. Compare the 2019 Outlander Sport LE vs SE Trims. What is the difference? Speaking of a higher trim level, the third in the Outlander Sport line-up this model year is the 2.0 SE. This trim level has the same mechanical features as the other two trims, so do not expect any major differences in how they drive. The differences here mostly come in the form of standard features. On the exterior, the 2.0 SE is given a silver garnish underneath the front bumper to help distinguish it from the lower trim levels. It also has the color-keyed folding side mirrors that you get on the 2.0 ES, except that the ones on the 2.0 SE are power-folding. This trim also gains a chrome tip on its single exhaust outlet and has the SE badge slapped on as its identifier. The interior marks a few more serious upgrades from the 2.0 LE. The 2.0 SE is given the addition of illuminated vanity mirrors on the visors. However, it loses the leather trim and red stitching that the 2.0 LE has on the steering wheel, shift knob, and parking brake. This makes the 2.0 SE look a lot more like the 2.0 ES on the inside. Of course, the 2.0 SE gets a few extra convenience features added to the mix. It shares the 2.0 LE's infotainment set-up, sound system, Bluetooth capabilities, and power locks and windows. However, it adds two more speakers to the cabin, as well as the FAST Key passive entry system, which comes with a panic function and push button start. Also, the 2.0 SE has the added benefit of a standard blind spot monitoring system. This set-up includes a rear cross-traffic alert function and lane change assist. Otherwise, its safety features are the same as the two lower trim levels. To get the utmost in driver aids, you will have to max out your budget on the 2.4 GT trim level. Compare the Outlander Sport SE vs GT Trim Levels. What is the difference? The 2.4 GT is now the Outlander Sport's line-topping trim after its previous one was removed for the 2019 model year. The 2.4 GT boasts a huge number of upgrades over the three 2.0 trim levels. The biggest upgrade is, of course, the 2.4-L engine. Of course, with a bigger engine, you get a diminished fuel economy. The 2.4 GT trim gets 25 combined mpg (23 city/29 highway). For the boost in power, though, the trade-off is worth it. Inside and out, the 2.4 GT is decked out in some seriously fancy features. On the outside, this trim level gains HID headlights with the automatic on/off function, rain-sensing windshield wipers, and the GT badge. On the interior, the 2.4 GT is decked out in combination soft-touch seats and gloss black and silver accents along the audio panel. An auto-dimming rearview mirror comes equipped with the HomeLink universal garage door opener. In addition to the blind spot monitoring system that comes standard on the 2.0 SE, the 2.4 GT trim gains several much-desired advanced driver aids. These driver aids are automatic high beams, a lane departure warning, and a forward collision mitigation system. All things considered, choosing the best 2019 Mitsubishi Outlander Sport trim level should be fairly easy now. As you can see, the three lower trim levels share a powertrain that just does not quite cut it. The lack of horsepower and torque means that launching the vehicle from a dead stop will take more time than many of its competitors. And the ride quality you get on those trims is too unrefined to make any of them the best deal out of the bunch. That's why the 2.4 GT is the trim level to buy. Not only does it have the better engine option, but it is loaded with more of the features that most drivers these days crave. All in all, the 2.4 GT might be the most expensive trim, but it is well worth the cost if you're going to go for the Outlander Sport.